Of all the technical achievements on film in 2015 (of which there are many) perhaps none is more awe inspiring than Sebastian Schipper’s “Victoria.” Unlike last year’s Oscar winner for best picture, “Birdman,” that wowed audiences for its ability to look like it was done in one shot, “Victoria” actually was made entirely in one shot. For the entirety of its 2 hours and 18 minute runtime the actors remain dedicated to each moment, particularly the title character who remains the focus of nearly every scene. The way the film maneuvers the city of Berlin and each moment is nothing short of breathtaking. The fact that it was done in one take over the course of one night, ending as the sun is rising, with a camera that genuinely feels as if it has no limits makes for one of the most unique cinematic experiences of the year. 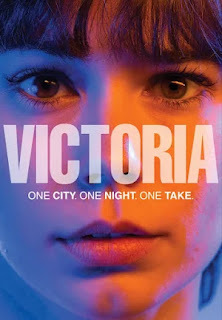 It begins at a club and follows Victoria (Laia Costa) as she leaves. As she does so, she meets four eager Germans looking for attention. They’re gathered around a car they claim is theirs until another man comes along and shoos them away from what we find to be his car. This moment sets up these four lost souls as the fun easy going type with loose policies towards honesty and criminality. The main face we come to know is Sonne (Frederick Lau), the charming ring leader with an obvious attraction for Victoria. His cohorts are an ill-tempered, bald headed man named Boxer (Franz Rogowski); a free spirited, long haired man, with a unique leather jacket who goes by Blinker (Burak Yigit); and finally a scrawny, quiet man who goes by Fuss (Max Mauff). They are all unique enough that it’s not difficult to tell them apart, and while initially we don’t know whether to trust them, Victoria finds something endearing about their free spirited nature. English becomes the primary language of communication between them because she doesn’t speak German and they don’t speak Spanish. She explains that she’s from Madrid, but has spent the last three months in Berlin working for minimal wages at a coffee shop which she’s due to open in just a couple of hours. It's too short a time to bother going home to sleep. Instead she agrees to accompany them as they roam the streets chatting, so they can “show her their world.” They stop by a convenience store and steal as many beers as they can carry when they notice the sleeping attendant. This fun, easy going portion of the film is a necessary introduction to the world and the people within it. They’re normal, fun loving twenty-somethings who eventually find themselves in over their heads. It begins as a budding romance that vaguely recalls Richard Linklater’s “Before Sunrise.” It's a charming love story that get's cut all too short as it moves into new territory. The second half turns into a compelling crime thriller whose rare energy is aided by Schipper’s decision to shoot the film as one take. And most of that energy can be attributed to the wonderful performances by the leads. Without the luxury of editing techniques, Schipper relies on the genuine performances given by Laia Costa and Frederick Lau in particular. As the two of them spend one of only two intimate moments together at her cafe, she passionately, almost violently plays the piano for him. When the camera settles on his face it’s a mixture of surprise and attraction. It’s the first real moment they’ve had all night. The walls start to crumble as the little white lies they'd been telling each other fade into honest expression of self. He’s so impressed he tries to encourage her to play professionally, but she explains how difficult it is and why she has given up on the idea. There is real emotion in this scene. Nevertheless their moment is cut short as the others come running with unmistakable anxiety in their eyes. Fuss is drunk beyond his capacity to stay awake, and Boxer informs them that he needs four people to do a job for a mob boss before the sun rises. Without knowing the full gravity of the situation Sonne asks her to help them as their getaway driver. It’s explained to her that while Boxer had been in prison, he accepted protection from a blond haired mob boss who now wants a payment of 50,000 Euros in return. His plan is to arm them and send them to rob a bank, after which he instructs them to return home and lay low for a while. Boxer and the others try to convince him to allow them a week to come up with the money. But their hand is forced when the blond haired man agrees with the stipulation that he keep Victoria as compensation. The fact that we learn all of this from the subtitles mean we know more than Victoria at any given moment. I couldn’t help but wonder what state of fear the uncertainty would cause. I also wondered what an experience this film would be if I refused the subtitles altogether thus putting myself in her shoes. Nevertheless, this film is effective at keeping us an active member of the group. Much the way “Sicario” strung us along with Emily Blunt’s character, “Victoria” hides certain details from us while we’re strung along with her. We encounter each new place and each new person with similar apprehension. Most films are easy to keep our distance from the events taking place. “Victoria” immerses us in the story with the characters in such a way we feel like we are there. I won’t spoil where the film goes from here. Suffice it to say this film is impressive on many fronts. It is a film with a meandering quality that feels adlibbed, yet the fact that it was done entirely in one take would require meticulous planning, careful timing and complete dedication to each moment. There was no pausing to remember a line, no stopping for the director to mold his actors. These things had to be done in advance. Rather than a film, this is a literal play that was captured on camera. The fact that it is all one take is endlessly fascinating. Any mistake would require the entire film to be restarted. The only noticeable mistake that wasn’t worth a reshoot includes a fumbled handoff of a cigarette. Yet credit remains with the actors who maintain their characters and continue the scene. The film relies heavily on its performances to establish tone. And it’s a credit to them that they pull it off, especially considering the wide range of tone from the first scene to the last. The performances are all so natural it feels like someone grabbed a camera and spent an entire evening with a group of people being themselves. We’re just along for the ride. It remains one of 2015’s greatest achievements.